"Geographical Center of the United States"
McCall, Idaho, received it's claim to fame for being at the geographical center of the United States for just one day. After Hawaii was added as the fiftieth state, two men from San Carlos, California, took it upon themselves to determine the new geographical center. 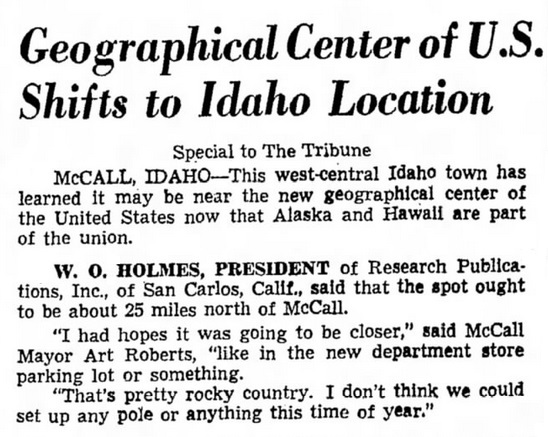 W. O. Holmes, president, and B. J. Holmes, vice-president, of Research Publications, Inc., made their own determination that a location approximately 25 miles north of McCall would be the new location. On April 6, 1959, the company notified the office of Idaho governor Robert E. Smylie to alert them of their important determination. Likewise, McCall's mayor Art Roberts and the Associated Press were also given the news. On April 7, 1959, newspapers across the nation printed a story about the geographical center location without waiting or checking on the credentials of those making the determination. This news came despite a press release that had been made by the Department of Commerce several weeks earlier on March 18, 1959, announcing that the new geographical center location was north of Belle Fourche, South Dakota. The exact position by latitude/longitude is not known, but W. O. Holmes told Governor Smylie it would be coming within 25 hours. (Apparently they needed one day plus an extra hour). Instead, the duo at Research Publications, Inc., stated that they had made an error in their calculations and that the location should instead be closer to Pondosa, Oregon. The Associated Press was once again notified, but few newspapers chose to run the story fearing it would be changed again. McCall's new claim to fame was a flash in the pan and disappeared just as quickly as it had arrived. The position of 45�'N 116�'W is only an estimation based upon a location 25 miles north of McCall and assuming they had rounded the position to the nearest 5 minutes of a degree. 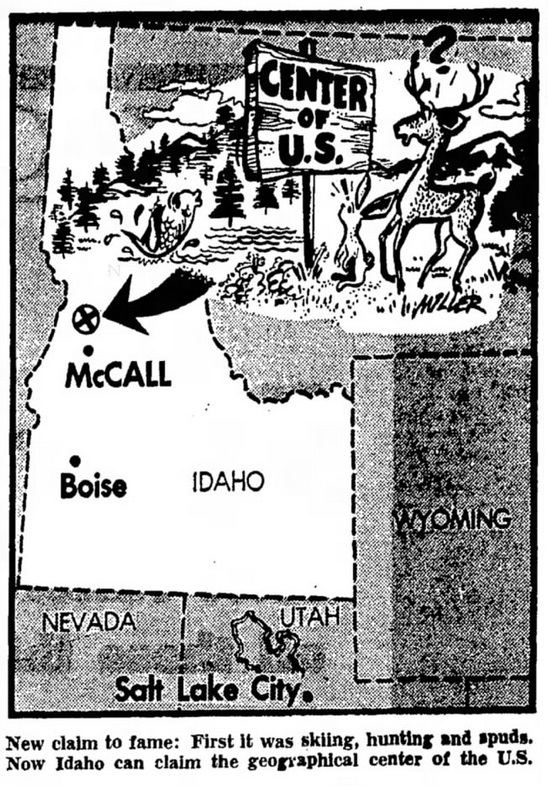 This is the only known image that shows McCall as the "Geographical Center". Salt Lake City Tribune. April 8, 1959. Newspapers carried the story across the nation on April 7, 1959. As a bit of irony, an Oshkosh, WI, newspaper could not even spell "Idaho" correctly.